The MAC 1200 digital, 12-lead electrocardiograph system offers comprehensive ECG solutions with practical features that meet the needs of hospitals, clinics, office-based practices and clinical trials. Its advanced algorithm capabilities, seamless connectivity to the MUSE Cardiology Information System and easy-to-use features provide the quality and convenience users require. One-touch operation for acquisition, analysis, storage and printing minimizes training. Measurements, interpretation and memory are available in many combinations to meet specific customer needs. Four user-definable fields for patient data-entry flexibility. 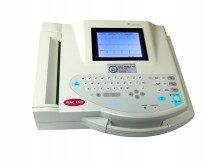 Waveform display allows rapid assessment of ECG rhythm and signal quality. Portable, lightweight design with carry handle allows the MAC 1200 to be easily taken wherever it’s needed. Full-size paper accommodates multiple standard report formats. Optional archivist paper available for longer-term ECG storage. Battery powered for added versatility. Optional CT (Clinical Trial) data guard feature is designed to protect the integrity of the digital ECG record, support facilitation of 21 CFR Part 11 compliance, enhance security and protect electronic records. Click the button below to add the GE MAC 1200 Resting Electrocardiograph to your wish list.